You don’t need to hire a landscaping company to have a lawn that your neighbors envy. With a few simple strategies, you can grow a beautiful lawn and maintain it without spending a lot of time or money. If you’re lightly watering your lawn every day, the grass will stay healthy only under these easy conditions. The better approach is to water deeply every few days. This will develop and strengthen the roots of your grass. Of course, the frequency of watering should depend on your climate. Lawns in most areas will thrive when watered two to three times per week. 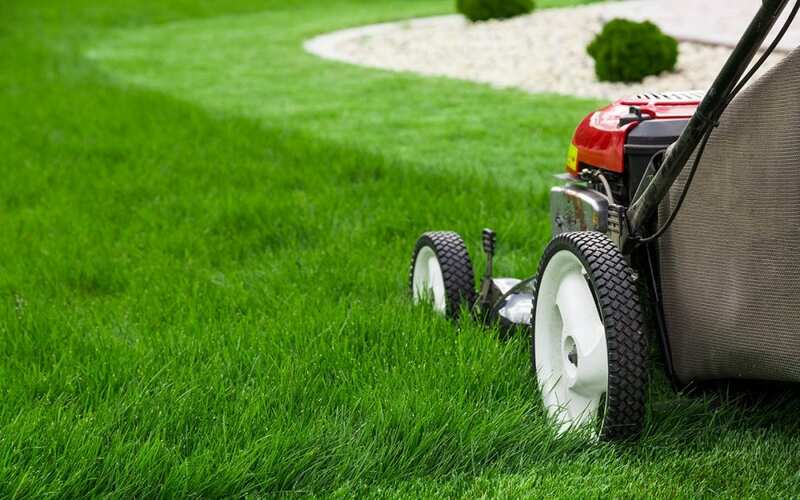 Not all grass needs fertilizer, but if you notice your grass is not growing as fast or as fully as you would prefer, fertilize once or twice a year. If you are living in the Southern United States where warm-season grasses are abundant, it is best to fertilize in spring or early summer. When fertilizing, it’s best to use a mechanical spreader that can evenly distribute the fertilizer. Here’s a way that laziness can actually help your lawn: after you mow, don’t pick up the grass clippings. They might make your lawn look less than perfect, but in the long run, they’re great for your soil. They release nutrients into the ground and help maintain soil moisture. The one exception is if you have already let your grass grow too long. Long grass clippings can cover your grass and prevent it from soaking up the sun. Read on to find out why you should never let your grass grow too long between mowings. Most grass will thrive when it’s cut to about two inches. If you live in a warm climate, one and a half inches might be better. If you’re in doubt, err on the side of caution. Grass that’s cut too short won’t look as full and isn’t as strong in the long run. However, be careful not to let the grass get too long in between mowings. Cutting off more than one third the height of the grass will stress the plant by slowing root growth. A dull mower blade is the easiest way to ruin your lawn when mowing. Keep the blade sharp so that it slices the grass rather than tearing it. We’ve all seen grass with brown, prickly tips that look unevenly shredded. Grow a beautiful lawn by keeping your mower blade sharp. Make sure the power is turned off before you remove the blade, then sharpen the downward-facing side of the blade with a metal file until you see a shiny edge. With these tips, your lawn will grow lush and green all summer long. An attractive lawn makes your whole property stand out, so it’s worth it to spend the small amount of time and effort outlined in the steps above. Homebuyer’s Inspection Service provides home inspection services including buyer’s inspections, pre-listing inspections, and new construction inspections to the Greater Dallas-Fort Worth area. Contact us to schedule an appointment!